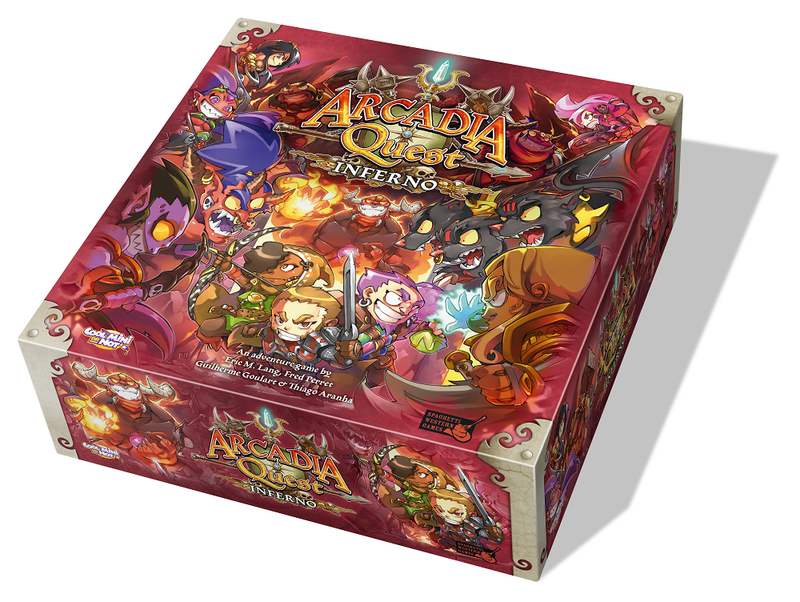 So almost immediately after my post yesterday I received notice from CoolMiniOrNot that there will be several expansions to Arcadia Quest. All the details (and pix) can be found at TGN. The first, Inferno, looks like a big box expansion with new guilds, tiles, and campaign(s). But, a smaller end boss was also announced that can be dropped into any existing campaign. Well… “small” is relative here since it’s a gigantic blue dragon. But, what interests me most from this announcement at CMON Expo is a smaller, stand alone game called Masmorra: Dungeons of Arcadia. All the showed at the con were a few miniatures, but my hope is that we’ve got an rpg on the way. So I have a lot of chibi miniatures. I have the original Super Dungeon Explore, Super Dungeon Explore: Forgotten King, Arcadia Quest Board Game, and Arcadia Quest – Beyond the Grave. Hopefully (yet doubtfully) I will also receive Ninja All-Stars by year end. With such a cornucopia of celluloid characters to choose, I’ve started ruminating on a chibi rpg. I realize that there are a few systems specifically designed for manga, but I find them clunky, tendentious and often out of print. For those not in-the-know. Chibi anime and manga are dominated by motifs of cuteness. It’s a world of wonder that boarders on the naïve. Think Pokémon; think Dragon Ball Z; think those Dragon Quest games. Everyone is good, deep down inside. All the player characters (PCs) have a good alignment. All NPCs are good as well. Heck, even reoccurring villains have the chance of redemption upon defeat. Zero hit points does not mean death. No player death. No NPC death. Even the lowly 1st level kobolds simply get knocked unconscious when they run out of hit points. No coup de grâce. This might seem redundant after the last few, but even when your enemy is lying on the ground defeated, there’s no coup de grâce. Sure, you can loot their unconscious bodies; but about five minutes after you leave they will wake up and wander off. Some of these characters will disappear, but many will become reoccurring villains or even positive NPCs. Characters know each other. None of this starting in a tavern. The characters are old friends who have grown up together. Period. As a matter of fact, almost everyone knows the PCs, even if the PCs don’t know them. And if it happens that an encounter starts without that knowledge, exposition is built into the fight. Chibi works with the kind of transparent information that you find in Monkey: Folk Novel of China or even The Iliad. You need to know who you are fighting, because you are a good guy. Weird animal companions. Part of the reason for keeping this rpg in a standard system like Pathfinder is to keep it simple, but there would need to be some modification of animal companions and familiars. Latitude will need to be taken so that the cuteness can shine through. Sentient meat pies, fluffy balls of colour and wisecracking cats are all acceptable animal companions. Lions, tigers and bears? Not so much. Everything levels up. Obviously characters level up. But, so should there weapons. And, so should animal companions, NPCs and the ever-present villains. This does not mean that I encourage “the treadmill,” but if you were given your grandfather’s awesome sword of awesomeness, it only makes sense that as you get better, so does it. This might be through some innate talent of the weapon, side quests designed for the tasks or maybe just specially tailored feats. Same goes with that little pink fluff ball of a familiar you have. Maybe at level 5 it gains an elemental power; at level ten it can puff up and fly you around. There are more ideas bopping around in my head, but this will do for now.